Pentagon Cuts Promise Political Pain : It's All Politics Cutting defense spending is about as popular as proposing Social Security cuts. In other words, not very. But it must be done despite the politics, say officials who have helped close military bases. 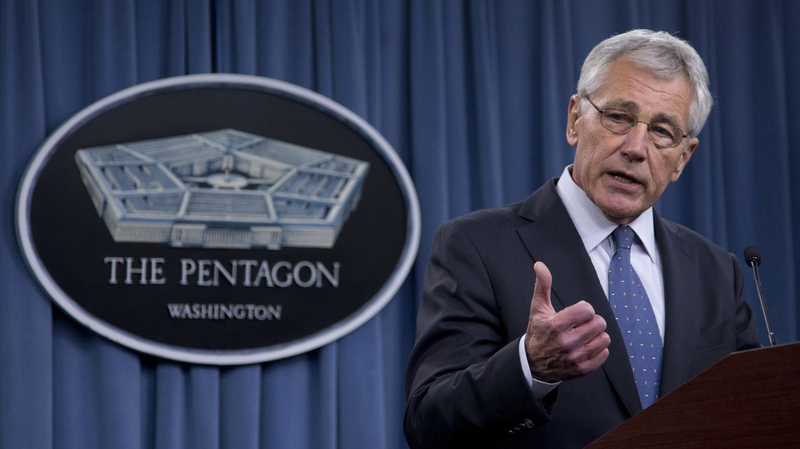 Defense Secretary Chuck Hagel briefs reporters at the Pentagon on Monday. Hagel and President Obama will need to fight through a wall of resistance to their proposed defense budget cuts, say former members of a defense base closing commission. Cutting defense spending in Washington is about as popular as proposing Social Security cuts. In other words, not very. Which explains why, following Defense Secretary Chuck Hagel's announcement Monday that the Obama administration's new budget would propose shrinking the Army, closing bases and ditching weapons systems, the responses from Capitol Hill lawmakers have been some version of "over my dead body." Wholly different was the reaction of two former federal officials who don't have to worry about electoral politics anymore: Samuel Skinner, who was transportation secretary under George H.W. Bush, and former Rep. James Bilbray, a Nevada Democrat who served on the Armed Services, Foreign Affairs and Intelligence committees. In 2005, both were members of the Defense Base Closure and Realignment Commission — BRAC — a bipartisan panel that recommended defense base closings to Congress. The difficult politics and intense lobbying surrounding defense cuts explained why BRAC existed to begin with: Congress essentially outsourced base-closure recommendations to the panel because it was politically impossible for members to do the job themselves. Lawmakers had to vote to either accept or reject the entire list. They accepted it. Both Skinner and Bilbray, now with law firms in Chicago and Las Vegas, respectively, told It's All Politics the Obama administration's proposed defense cuts are a necessary corrective to the surge in defense spending that occurred after Sept. 11 as the U.S. fought two wars. "Something's got to be done," Skinner said. "Unfortunately as a result of a lot of decisions that were made over the last 10 years ... we've continued to ramp up defense spending at an unprecedented level. It's got to come down. You can argue where the cuts should be made. But everybody knows it's unsustainable going forward. Somebody's going to have to make some hard calls here." Bilbray echoed those remarks: "The fact is, as the military, as they totally get out of Iraq and close down in Afghanistan, I think it's going to be a natural consequence that the size of the military will shrink," he said. In a testament to how politics was never far from the process, both men recalled how President Bush had to use his recess appointment powers simply to get them on the base-closure panel. Their nominations were delayed by senators, including Trent Lott, a Mississippi Republican, who sought to stall the process because they objected to plans to close facilities in their home states. When the commission was finally able to get to work, it was left with only three months to complete the process, Bilbray said. But even that was better than the current situation. Obama has proposed a new base-closing commission. For two years running, however, Congress has rejected it. Skinner said his understanding is Congress doesn't want to again lose control of the process. Even so, the Obama budget due to be released next week will once again propose a BRAC that would go into action in 2017 — meaning it would avoid raising hackles in 2016, a presidential election year. There's plenty of outrage already from Sens. John McCain of Arizona and Lindsey Graham of South Carolina. Skinner said the pushback was fairly predictable. "It's very difficult for senators where there are strong military installations to come out and say we should make these cuts," he said. "They're trying to defend their constituents from some of these cuts. But everybody's going to have to take some of these cuts. They're going to happen." It's not just Capitol Hill where political leaders have torn into the Obama administration's proposed cuts — the resistance reaches to the state capitals. Republican Gov. Nikki Haley of South Carolina and other governors have bridled at cuts proposed for their state National Guard units. Those units play indispensable roles during disasters, they contend. Bilbray suggested that's not the entire explanation for why many governors will resist cuts to their guard units. He offered a story by way of illustration. Bilbray once got into a dispute with a Mississippi congressman for proposing reductions in guard units similar to those being proposed for active-duty forces. "You would have thought I had asked to sleep with his wife," Bilbray said. "He was really angry about it. The National Guard is sacred in many of the Southern states. There's a tradition. The father, grandfather and great-grandfather served in the guard." For that reason, National Guard units are traditionally much easier to fill in the South than elsewhere. Military officials once told him it might take six months in the South to fill a division that might take five years anywhere else. "That will explain the resistance you'll see from some of those Southern senators" and governors in coming weeks, he said.